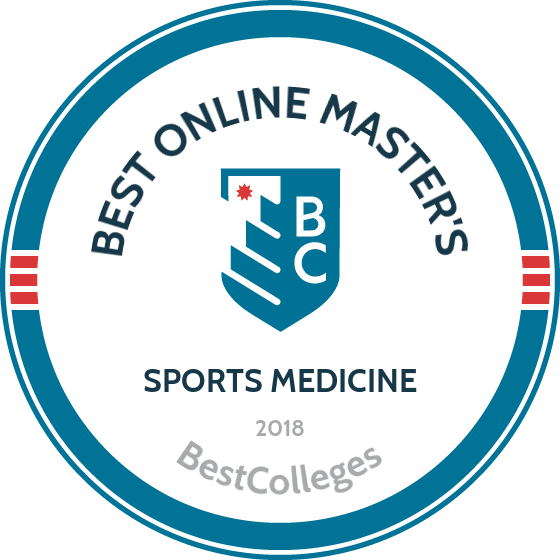 WHAT ARE THE BEST ONLINE MASTER'S IN SPORTS MEDICINE PROGRAMS? Earning your online master's in sports medicine will open new doors of opportunity for career choices, salary increases, and personal satisfaction. A master's in sports medicine provides you with the foundation necessary for pursuing careers in physical therapy, sports nutrition, and even other fields of medicine. The U.S. Bureau of Labor Statistics reports a growth rate of 34% in the field of physical therapy alone, a rate substantially higher than most other job fields in today's market, and with starting salaries in the low $80,000's, a career in sports medicine is especially lucrative. Yes! Graduating from an online master's in sports medicine program not only prepares you for work in professional fields such as physical and occupational therapy, but generally also leads to an increase in salary. A master's degree certainly makes you more marketable within today's sports medicine field. Generally, you will need only a bachelor's degree to be admitted into a master's program. Some programs may require that your bachelor's degree to be in sports medicine or a related field, while others may not have this specific requirement. Each sports medicine master's program will likely have its own set of requirements that students must meet prior to gaining admission. CAN I WORK WHILE I COMPLETE MY ONLINE MASTER'S in SPORTS MEDICINE? Yes! One of the best things about online degree programs is their flexibility. Online programs are designed for working professionals, and are specifically set up to allow you to continue with your day-to-day life while completing your coursework. WHAT ARE THE ADVANTAGES TO EARNING MY MASTER'S IN SPORTS MEDICINE ONLINE? The advantages to earning your online master's in sports medicine are numerous--from flexibility in scheduling to the ability stay with your current job while you work through the program. Online master's programs allow for much more freedom in your path to completion, and are ideal for current working professionals looking to advance their careers without uprooting their lives. The master's of science in sports medicine from the University of Western States is an advanced degree specialized on chiropractic care. Students commonly include current chiropractic students and chiropractic physicians, though health care professionals are also encouraged to apply. The 38-credit program can be completed in less than two years, and coursework is delivered in a hybrid format. Though most classes are offered online, there is a required hands-on lab session taken over one weekend at the UWS Portland campus. Off-campus students can complete practicum hours at approved locations in their local area. Most candidates complete this online sports medicine degree in six or seven quarters. Students enrolled in the UWS doctor of chiropractic can pursue both programs concurrently, and the degrees will both conclude at the same time. Applicants must have a relevant bachelor's degree with a minimum GPA of 2.5, and experience in a related field to be considered. Based in Washington, DC, George Washington University was founded in 1821 and currently boasts nearly 300,000 alumni. The school offers a master of science in exercise science in strength and conditioning, the goal of which is to demonstrate the value of anaerobic exercise, and to help students create programs that promote healthy lifestyles. For this 36-credit degree, students take courses like biochemical analysis and advanced exercise physiology. Learners also participate in professional advancement opportunities through seminars, lectures, and symposia. Other requirements for this online sports medicine degree include completion of the Collaborative Institutional Training Initiative and an academic integrity quiz. Key concepts of this master's include anaerobic exercise, osteoporosis treatment, and resistance training. Graduates may work for colleges or health companies as teachers, coaches, and researchers. Completing this master's also prepares degree seekers to take the Certified Strength and Conditioning Specialist exam and the Level One Weightlifting Coaching Course. A.T. Still University was established in 1892 as the original school for osteopathic healthcare. Today, the military-friendly university boasts a Gold Achievement Award from the American Heart Association, and provides one of the nation's best sports medicine online degree programs. This master of science in kinesiology requires 42 credits, 12 of which go toward specialization tracks chosen from the following subfields: sports conditioning, exercise and sports psychology, geriatric exercise science, and corrective exercise and orthopedic rehabilitation. Learners may select no more than two specializations. Mandated courses for all tracks include motor control, advanced fitness nutrition, and functional anatomy. The curriculum for this online master's degree in sports medicine helps professionals develop exercise plans and understand physical and behavioral concepts of exercise. The department uses Blackboard for course delivery. For admission, applicants need a bachelor's degree and -- for those choosing an exercise-based specialization -- prior career experience, training, or licensure in the field is necessary. For more than 40 years, the United States Sports Academy has provided sport education to coaches, managers, administrators, and specialists interested in athletics and sports medicine. Established in 1972, USSA remains the only freestanding school of sport education in the United States. The master's of sports science is a 33-semester hour program that is offered entirely online. This online master's in sports medicine degree offers five major areas of study: sports coaching, sports health and fitness, sports management, sports studies, and recreation management. Any of these majors, except recreation management, can be combined for a dual major. The program also includes areas of emphasis, including NCAA compliance, olympism, personal training, sports psychology, and sports hospitality management. Students can choose from three tracks: thesis, non-thesis, or mentorship. A comprehensive exam is required for both the non-thesis and mentorship options. Applicants must have a minimum GPA of 2.5 to be considered. The master's of science in kinesiology at The University of Texas Rio Grande Valley offers a master's of science in kinesiology with a thesis or non-thesis track. Degree requirements for both programs include 12 core credit hours, 18-21 for electives, and a capstone requirement of a thesis or independent study, which adds three to six credits. The UTRGV sports medicine degree online program offers courses in a completely virtual environment via the University of Texas Online Consortium or UTOC. Students may take classes from any of the participating UT System schools as well. Online students receive the same instruction and follow the same course sequence as on-campus students. The program emphasizes contemporary concepts on physical activity and wellness throughout the curriculum. Students can complete the program in just three years. Applicants must have a bachelor's degree with a minimum GPA of 3.0 to be considered. The St. Paul branch of Concordia University is among 10 schools connected to the Lutheran Church-Missouri Synod, and has a history dating back to 1893. This Minnesota university provides students with 25 graduate options, including the master of science in exercise science. To obtain this research-heavy degree, students must earn 33-36 credits in courses such as clinical exercise testing, biomechanics in exercise, and nutrition and metabolism. Courses and projects build understanding of safety, rehabilitation, and exercise as a means of avoiding illness. Overall, the curriculum for this online sports medicine degree helps learners become leaders in the exercise field and secure positions as coaches, nutritionists, therapists, and trainers. For admission, degree candidates must have a bachelor's in a similar discipline and evidence of field experience, whether through a career or prior research. Military students receive benefits from the school, including a lower tuition rate and tuition assistance through the Yellow Ribbon Program. Louisiana State University's history dates back to the 19th century. Today, the institution boasts many notable alumni -- including NASA engineer, Renee Horton -- and educates learners through programs like the master of science in kinesiology with a specialization in sport management. Learners must complete 36 credits to earn this online sports medicine degree. Eighteen credits must be acquired through classes like administrative problems in kinesiology and economic issues in sports. Students choose the remaining courses from electives such as facilities management, sports administration, special topics in kinesiology, and introduction to research methods. Degree candidates may also enroll in independent studies for up to six credits. The university delivers online courses through the Moodle learning platform and gives online students access to tutorials for IT training. Distance learners may also communicate with an enrollment specialist, take advantage of the university's library, and seek assistance from the career services department. In 1912, Mississippi Normal College welcomed its first 227 learners. In 1962, the college became the University of Southern Mississippi, and the school currently enrolls about 15,000 students. The university's master of science in kinesiology with an emphasis in physical education is among the best online master's in sports medicine programs. This degree requires at least 36 credits, including courses such as advanced methods of teaching physical education, motor learning, and sport skill analysis. Learners must also choose a thesis or nonthesis track. Students can fulfill all degree requirements online, but may need to provide videos for exercise courses. This program prepares graduates to become physical education teachers, sports coaches, program directors, and fitness consultants. The university uses the Blackboard learning platform and offers learners online tutoring through the Writing Center and Speaking Center. Online students can also take advantage of the school's library through virtual resources and live chats with librarians. The master's of science in kinesiology from the University of Texas at Tyler is a 36-credit program that prepares students for careers related to exercise. The program emphasizes the science behind the body and its movements, and is a good fit for clinicians who regularly work within the discipline, including physical therapists, athletic trainers, and wellness coaches. This online master's in sports medicine is taught in three formats: on-campus, distance learning, and hybrid. The curriculum includes courses on research design, biomechanics, motor learning, biometric methods, and more. Campus visits are not required for online students. Coursework is delivered asynchronously, and the program concludes with either a thesis or internship. Non-thesis students also take a comprehensive exam. Applicants must have a four-year degree, a GRE score in the 30th percentile, and meet the graduate school requirements for UTT to be considered. In 1908, the First District Agricultural and Mechanical School opened to students. The institution became Georgia Southern University in 1990. Today, the university offers over 140 programs, including the master of science in kinesiology with an emphasis in coaching education. For the 36-credit program, students complete courses -- including teaching analysis, team dynamics, and injury prevention -- in pairs over six semesters. For instance, learners must take sports administration and sports biomechanics in the spring, while injury prevention and research methods for coaches are designated for the fall. The program embraces a cohort format so that students go through courses as a group. Degree candidates also need to coach in some manner during the program. This online master's in sports medicine adheres to the National Coaching Standards for a level-five status, and educates current and future coaches in performance enhancement, athletic training, coaching administration, and coaching effectiveness. The MS in athletic training program from the University of Hawaii at Manoa prepares students for careers as sports trainers in a variety of industries, including education, healthcare, and entertainment. This online sports medicine degree comes in two forms: a professional athletic training program that prepares graduates for BOC certification, and a post professional athletic training program for students who want to become scholars or leaders in athletic training. There are six programs and pathways under the kinesiology and rehabilitation science department at UH Manoa, and delivery of curriculum is mixed between online and evening classes. The master's in athletic training program offers evening sessions on campus in Honolulu. Applicants must submit GRE scores, letters of recommendation, and a statement of objectives for admissions review. They must also submit documentation of at least 200 hours of observation to be considered. The master's of arts in athletic training at Fresno Pacific University is designed specifically for those looking to become practitioners. The core courses for the 30-credit online sports medicine degree delve into the legal aspects, research methods, and values of kinesiology. The curriculum teaches students about core concepts like administration, therapeutic exercise, and pedagogy and prepares them to pursue athletic training careers in education, entrepreneurship, or the private sector. The program concludes with a comprehensive examination. Delivered fully online, this flexible MA in athletic training enables students to earn their degree while working full-time. The application process begins with a phone interview, wherein prospective candidates explain their academic history and career intents. Applicants must have an undergraduate degree in athletic training or a related field with a minimum GPA of 2.75 to be considered. The master's of science in human movement science from Concordia University-Chicago is an accelerated, 30-credit program that prepares students for work in coaching, research, workplace safety, and more. Students learn how to develop injury prevention programs, and how to help their patients improve functional capacity and correct faulty movement patterns. Coursework is taught in 10 eight-week sessions and students are accepted throughout the year. The program is organized in a cohort model with an average class size of 12–18 students. Like many of the best online master's in sports medicine programs, CUC's flexible courses are offered entirely online. Applicants must have a bachelor's degree and a cumulative 2.85 GPA to be considered. For those who fall below these minimums, there is a provisional admissions process. For international students whose second language is English, a TOEFL score of at least 550 is also required. Based in Fargo, North Dakota State University's original name was the North Dakota Agricultural College. This title changed in 1960, and today, the institution educates almost 15,000 learners. NDSU offers the master of science in health, nutrition, and exercise science, with an option for leadership in physical education and sport. To earn this 30-credit online sports medicine degree, students take courses such as psychological foundations of sport and physical activity, as well as supervision and management. Students can choose a practicum, master's thesis, or master's paper to conclude the program. The curriculum assists students wanting to advance into coaching or teaching positions. Classes rely heavily on projects and case studies, though exams are still administered. Blackboard, as well as email and chat rooms, are common platforms of delivering coursework. For admission, students must have a bachelor's degree in kinesiology and a 3.0 GPA. Applicants with 24 college credits can apply for transfer scholarships, including the NDSU Transfer Award. The University of Louisiana at Monroe offers an online master's degree in sports medicine with three areas of emphasis: applied exercise, sports management, and clinical exercise physiology. All three concentrations require 36 hours to complete and are offered entirely online through eULM. The master's of science in exercise science with a concentration of sport management is split between 30 hours of required core courses, three credits of electives, and an internship. Students in the sports management track develop their business acumen through courses in governance, ethics, finance, public relations, and more. Applicants must have a combined score of 725 or better, which is derived from multiplying a student's GPA and GRE scores together. Students whose score falls between 685 and 724 can still apply, but will be admitted on conditional status. The University of Northern Colorado's master's of arts in sports and exercise science is designed for adult learners currently working in the field of athletic coaching. It is a general program that can be applied to all coaching endeavors across various sports. The curriculum includes 30 credits and generally takes 18 months to complete. This program emphasizes the science of exercise, sport pedagogy, training principles, and applied research. In lieu of a comprehensive exam or thesis, students will present a portfolio on effective coaching in their final semester. An online orientation is also provided. Graduates leave the MA with advanced expertise in all aspects of the science and are prepared for careers as teachers, coaches, or advocates. UNC's online master's in sports medicine degree is authorized in all U.S. states. Applicants must have a bachelor's degree with a minimum GPA of 3.0 to be considered. The master's of science in health and human performance at McNeese State University is offered through the Burton College of Education. The program explores the health and human performance discipline, which relates to many aspects of health, wellness, and rehabilitation. The 33-credit sports medicine degree online program offers three concentrations: physiology, nutrition and wellness, and health promotion. The health promotion concentration is designed to help teachers and coaches learn the fundamentals of advocacy, health habits, physical fitness, and recreation. Candidates have six years to finish their degree. MSU is authorized to provide online learning to students in more than 30 states. Transfer students can apply credits for which they have earned a “B” grade or better. Prerequisite courses include exercise physiology and tests and measures. Applicants must have an undergraduate degree with a major or minor in health and human performance or a related field to be considered. The University of Texas at El Paso has earned a Carnegie Classification of Doctoral/Research University and educates over 20,000 learners. Opening in 1914, the institution was one of the original schools in the University of Texas system. The school offers an online master's in sports medicine through the master of science in kinesiology with a concentration in exercise science. Degree candidates for this 36-credit program must choose the thesis or nonthesis path. For either option, learners complete courses like advanced exercise physiology, biochemical basis of sport, and motor learning and control. However, the nonthesis track requires an additional course chosen from options such as coronary intervention and advanced topics in kinesiology. Students who earn a "D" in any course, or a "C" in more than one course, may be expelled from the program. Online learners can access the school's research materials and connect with sources like the El Paso Historical Society through the university's website. The master's of science in kinesiology from the University of Texas of the Permian Basin takes a comprehensive look at diverse groups of people and how each requires a different approach to exercise, conditioning, or rehabilitation. This 36 credit online master's degree in sports medicine tackles subjects like historical development, facilities, research method, and scientific principle. The program has no practicum requirement and course delivery is completely online. A thesis or research project serves as the capstone experience, and the final exam is an oral defense. The program must be completed within eight years, though most students finish well before the deadline. As part of the University of Texas Online Consortium, students are afforded the flexibility of taking courses from any of the participating universities. Applicants must have an undergraduate degree in kinesiology or a related area to be considered. In 1909, the Third District Agricultural School began. This institution eventually became Southern Arkansas University, and today, the school educates more than 4,000 learners. The university's master of science in kinesiology with a focus on coaching is a 33-credit program that includes courses like sport administration, statistical methods, and sport safety and injury prevention. The curriculum concludes with a capstone portfolio. Program goals are to train learners to use technology, communication, problem solving, and kinesiology knowledge to advance careers. This program adheres to the National Standards for Sport Coaches and can be completed within two years. Applicants for this online master's in sports medicine should call or email the program director and submit a resume, cover letter, Acknowledge of Program Requirements form, and mental approval form. Transfer students may qualify for a scholarship that is delivered for a maximum of four semesters, but only when entering the fall semester with 48 transfer credits. The University of the Southwest began as Hobbs Baptist College in 1956. The institution transitioned into being a nondenominational school in 1962 and embraced a final name change in 2008. To earn a sports medicine degree online from the university, students can enroll in the master of science in education with an emphasis in exercise science. This program requires 33 credits and guides learners through lectures, internships, and labs in topics that include clinical evaluation, nutrition, and fitness assessment. Students gain experience working with people with diverse ages, weights, and health issues like cardiac problems and diabetes. Degree candidates may complete all program requirements online. The curriculum helps health workers transition into fields such as health education, sports medicine, exercise physiology, and sport management. The university connects distance learners with online tutoring resources, including the Khan Academy where degree candidates can watch more than 2,700instructional videos on topics like physics and history. Ashland University began in 1878 with the name of Ashland College. This North Central Association university now educates over 6,000 learners from a Christian perspective. The institution offers the master of science in applied exercise science that focuses on strength and conditioning. To earn this online sports medicine degree, learners take courses like sports medicine principles for sports professionals, as well as scientific foundations of nutrition in sport. The curriculum trains degree candidates for certifications such as the Certified Strength and Conditioning Specialist or American College of Sports Medicine Health/Fitness Instructor. The degree also prepares students to assist others in physical endeavors, including rehabilitation and weight loss. Degree seekers must meet with faculty twice to demonstrate exercise abilities. Learners may finish all other requirements online and complete the degree in just over a year. Distance learners can access the Ohio eTutoring Collaborative, which provides students with synchronous and asynchronous assistance in fields like anatomy and physiology, writing, and accounting. The Texas A&M University at Corpus Christi began in 1947. Today, the institution educates more than 12,000 students and boasts accolades from the White House for the school's College of Nursing and Health Sciences. Students have the option of completing coursework in-person, completely online, or in a blended manner. The university delivers courses through Blackboard and offers a workshop every semester to assist students in using the platform. Online learners can also access the Mary and Jeff Bell Library, attend online orientation, and download the school's newsletter to stay updated on upcoming events, upgrades, and academic tips. A Christian college located in Texas, Houston Baptist University focuses on small class sizes and individualized learning. The school hosts 17 Division I sports teams, including football, basketball, beach volleyball, and golf. HBU’s Master of Science in Kinesiology and Sport Management prepares students for careers in both business and athletics. The 35-credit curriculum includes classes in management skills and the social aspects of sporting. Key sport business courses include management of sport delivery systems, financial management in sport, marketing management, and event and facility management. Students also examine legal issues in sport, the history and culture of sport, and ethical issues in sport management. The program culminates in an internship and a thesis. Applicants must submit official transcripts and GRE scores. HBU waives the GRE requirement for students with a GPA of 3.0 or higher. Approximately 90% of students receive financial aid. Known as "the Coaching Factory" due to its success producing championship-winning coaches, Southern Utah University boasts competitive sports teams and athletic programs. Alumni have won 507 state championships and more than a third of Utah high school football coaches hail from the school. SUU's master of science in sports conditioning and performance meets the needs of coaches, personal trainers, physical educators, and physical therapists. Although most courses are available online, students must attend three clinical workshops on campus. The 33-credit curriculum includes coursework in sports management, resistance training programs, motor skill acquisition, sport nutrition, and psychological aspects of sport performance. Students also complete a thesis. Applicants must submit GRE or MAT scores. Additionally, applicants to the sports conditioning program must hold a major or minor in physical education, exercise science, or sports medicine; be a licensed or certified fitness professional; or complete undergraduate courses in exercise physiology and biomechanics. When it comes to online master's in sports medicine programs, details will likely vary depending on the school and the program you choose. So, it's important to look carefully at all the requirements and details of each program you are interested in when looking for the best sports medicine master's degree. The best sports medicine master's degree programs offer a wide range of interesting and engaging courses that effectively prepare students for careers in the field. While courses may differ by school, sample curricula have been listed below. Applied Anatomy for Sports Medicine: Through lectures and hands-on cadaver dissection experiences, students learn extensively about orthopedic anatomy. These skills may help prepare students for careers in athletic training, and for future doctoral studies in orthopedics. Physiology of Exercise: Students learn about the various bodily systems involved in exercise, including pulmonary, cardiovascular, endocrine, neuromuscular, and renal. Through learning about these systems, students will be able to understand how to optimize exercise processes for physical health, and avoiding injury. This course prepares students with skills needed in fields such as athletic training and physical therapy. Biomechanics of Sports Medicine: This course emphasizes biomechanical theories, while teaching students about major orthopedic injuries and how to best diagnose, prevent, and treat these injuries. HOW LONG DOES IT TAKE TO GET AN ONLINE MASTER'S IN SPORTS MEDICINE? There are a number of factors that impact how long it will take you to complete an online master's in sports medicine. For example, entering a cohort-based program may require more time to completion, as you will be working alongside a group of fellow students that begin the program at the same time as you. On the other hand, an individually-paced program might allow for more flexibility to complete coursework on a timeline of your own design. Generally, earning a master's in sports medicine requires that students complete 38 to 45 credit hours. Working on a full time basis, these credit hours could be completed in just two years. Working on a part-time basis may lengthen this time, as well as whether or not your chosen program is delivered synchronously or is self-paced. Certified Specialist in Sports Dietetics: This certification is for those wishing to practice as a certified dietitian and/or nutritionist within the context of a sports medicine setting. This license requires an exam, but other requirements may differ at the state level. Certified Athletic Trainer: This certification is awarded by the National Athletic Trainers Association. By taking and passing an exam administered by the NATA, those with this certification can then practice as professional athletic trainers alongside supervising physicians. In addition to all of the other important factors that go into choosing the best program for you, you will also want to consider what kind of accreditation by which each program is backed. Schools are often regionally accredited, which is generally more prestigious, but some may also be nationally accredited. Regional accreditations include the Higher Learning Commission, which accredits schools in 19 north central states that meet its specific criteria. When it comes to programs in sports medicine, you might also want to look for a few program-specific accrediting agencies. For example, the Commission on Accreditation of Athletic Training Education (CAATE) provides accreditation for programs with concentrations in athletic training. The U.S. Department of Education (ED) is a government agency that handles school-related policies throughout the United States. This federal agency is also responsible for providing aid and assistance to students and you will submit your Free Application for Federal Student Aid (FAFSA) to them each year you are in school in order to receive financial aid. The ED and Council for Higher Education Accreditation both provide a comprehensive lists of accredited post-secondary schools on their websites for you to check. When deciding on the best sports medicine master's degree program for you, consider the fact that having a master's degree can raise your salary potential in the field, particularly depending on the area in which you specialize. Entry-level careers, such as those you might obtain with a bachelor's degree, will earn you significantly less per year than the careers you can pursue with a master's degree. See the table below for examples of how a master's level education can improve your salary in these specific fields. Although earning a master's degree in sports medicine will earn you a higher salary just about anywhere, there are a few places in the United States that pay higher than average in this field. Nation-wide, athletic trainers earn an average salary of about $46,000. However, some states offer average salaries far higher than the national average. See below for a list of five such states. Earning a master's degree in sports medicine prepares you for a wide variety of exciting and interesting careers and, with growth projected at a rapid pace in the coming years, the fields of sports medicine and management continue to boom. Those with the dedication, strong worth ethic, and patience that jobs in these fields often require are increasingly likely to find a great number of opportunities upon graduation. Unlike general personal trainers, exercise physiologists use their knowledge and expertise about the body and its systems to create exercise regiments meant to help patients recover from physical trauma or injury. While mostly self-employed, some also work in hospital settings. These therapists work with patients recovering from illness and/or injury. The goal is to help patients regain necessary movement, flexibility, and functionality to be able to carry out daily activities. Professional organizations are an integral part of pursuing a higher degree. Throughout your program, you can utilize the resources these organizations provide to network, learn about internship opportunities, and simply broaden your knowledge of the field. Upon graduation, these organizations can help you land a good job, offer conferences and professional development events, and keep you connected with other professionals in your field. See the list below for a few examples of prominent professional organizations in the field of sports medicine. Founded in 1991, this organization formed to fill a gap in the field of sports medicine by creating a forum for non-surgical, primary sports medicine physicians. Today AMSSM promotes research in the field, encourages professional relationships, and advocates for excellent patient care. The ACSM works to further scientific research in the field of sports medicine. Boasting over 50,000 members, the group provides a stellar networking forum for sports medicine professionals, and helps connect members with certifications and professional development opportunities. Based at St. Vincent's Hospital in Birmingham, Alabama, the AMSI is a non-profit organization that promotes research and education aimed at better understanding, treating, and preventing sports injuries. While an online master's degree is typically cheaper than one earned at a brick-and-mortar school, many students still need financial help to ease the costs of tuition. Fortunately, many online schools offer financial aid to online students. All online students should start by filling out the Free Application for Federal Student Aid (FAFSA). Students who apply for aid must be enrolled in an online bachelor's program accredited by a federally recognized accreditation agency. Students in sports medicine programs might also consider applying for program-specific scholarship through major organizations in the field. Paid internships are also a great way to fund your master's in sports rehabilitation.